Click "Database" from main menu, click "Catalogs". Select the catalog you wish to design data input form, click "Form Designer" button. If you have created a new field (like "Name Surname") in a catalog, the field will not become visible until you place it to the record form using "form designer". This window displays the list of all fields existing in current catalog on top right side. Find and select the field you wish to place from the field list box. Click add button to place it into the form. You may also drag and drop the field into the design area. Drag the field by clicking on to the label to change its location. If the design area is not sufficient to fit the field, you may resize the whole window by dragging the right bottom corner of the form designer. To remove a field, first select it by clicking on its label and click "Remove" button. It is safe add/remove fields anytime you need, as no actual data is	affected when you change the design of data forms. Select a field from design area and click the "properties" button at the bottom of field list. Auto Expand to Right / Bottom: Fields with certain data types allow to expand automatically to the right or bottom in order to fill the available space on record forms. It is most usefull for long text fields, as they can be enlarged when the record window is maximized. Hide Field Label: Check this box to hide the field label from record window. Most usefull when you need to put customized labels in special locations. In this case you may add a drawing object of type label to replace the field label. You may add labels, lines or other shapes as decorative objects on record forms. Select the drawing tab from item list area and add the drawing object you like. You may adjust various properties of them if you select them on design area and click the "properties" button. Use the "bring to front" or "send to back" buttons to arrange the overlapping behavior of the objects. 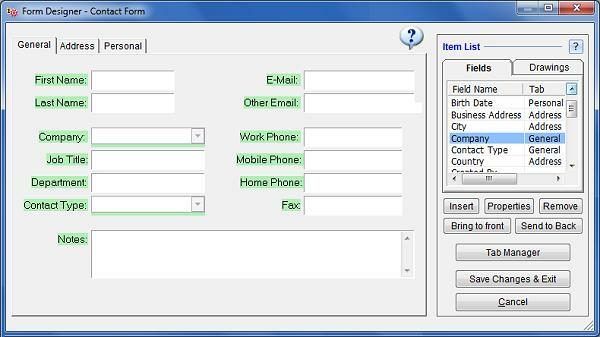 Once you have added a field into the form area, you will need to resize it as well as move it to a location you prefere. To move a field, drag and drop it with your mouse. To resize a field, select it first and drag the black squares. Tabs are the pages of a record form which are displayed on top of the form. SpeedBase creates the first page automatically and names it as "General" by default, which you may change later. If there are too many data fields to fit into your screen, you may distribute them into two or more tabs (pages). Click the "tab manager" button for this purpose. Form Tab Orders: You may here create new tabs, delete unused ones and rename them. Use the up/down arrow buttons to change the order of tabs. This will allow you to move all form items on a form page to another. Field Navigation Order: This section allows you to precisely adjust the order of cursor navigation whenever you press the "tab" key while editing a record. This helps users to enter data more efficiently without using the mouse. Important! If you create a new tab page, but exit form designer without inserting any data or drawing item into this new tab, the tab will automatically be deleted! You should place at least one object into the empty tab if you want to keep it. Save Changes & Exit: Clicking this button will save all changes to the database and closes the form designer. Discard Changes & Exit: Clicking this button will cancel all changes you have made and closes the form designer.